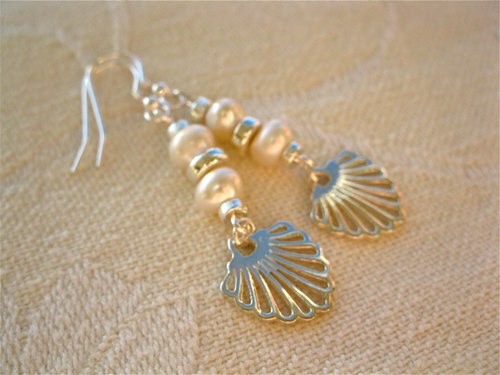 These sterling-silver scallop shell and pearl earrings would make a unique gift. The shell shape is symbolic of El Camino de Santiago (the 1,000-year-old pilgrimage to the shrine of St. James in the Cathedral of Santiago de Compostela) and, along with the addition of the natural pearls, they make a truly stunning piece of jewellery with meaning. Some 200,000 travellers journey along the Way of St James each year from all over the world, and many carry with them a scallop shell symbol like the ones in these earrings. Wish your friends and loved-ones well by sending them this beautiful and meaningful present. It could make the ideal gift for any special event / occasion. Pearl jewellery has been popular as a symbol of purity (and peace) for centuries - supposedly lifting people's spirits but, at the same time, making them feel calm and dignified. Pearl jewellery is also said to improve self-worth and help people see themselves as they really are. A gift of a pearl is often presented as an emblem of modesty and freedom - and one that symbolises love, success and happiness. Pearl is the 'birthstone' for June and can be associated with the zodiac sign of Cancer. It is also the Anniversary gem for the 3rd year of marriage, and is frequently gifted as an Engagement present. Dimensions: The earrings measure approx 56mm in length including the sterling silver wires. They consist of real pearl gemstones, silver-coated washers and sterling silver scallop shells and earwires. The Way of St. James criss-crosses Western Europe, arriving at Santiago through Northern Spain. It is generally regarded as a journey of the body, mind and spirit. 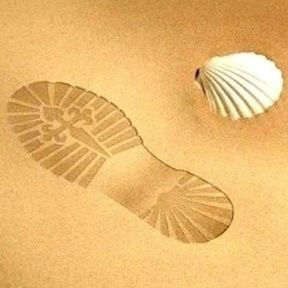 Modern travellers choose to do the Camino for personal, spiritual and/or religious reasons - or simply to take time out from their busy, modern lives. For many, the walk is to find inspiration - improving their outlook on life, bringing them into closer contact with nature and expanding their cultural horizons through contact with other pilgrims. Everyone experiences the journey in a different way. Gift these delightful scallop and pearl earrings to inspire your friends . . whatever their journey. They come gift-wrapped, like all our presents - and we can print a personal message on your behalf.